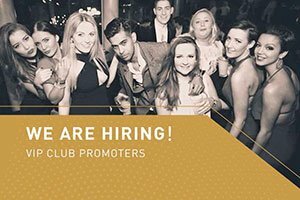 The legendary Paper Club Soho has reopened its doors again in 2017 and is attracting again VIP’s and celebrities from all over the world. Shortly after it’s reopening, Paper Club Celebrity Drake visited Paper and made sure he and his entourage had a good time, by spending over £30.000 on drinks. Here is what you need to know about the Drinks and Bottle Prices Menu for Paper Club for your planned night out. Let us show you the Paper Club Bottle Price Menu for VIP tables, so you can plan your Paper Table Booking in advance. What is the Paper Club Bottle Price Menu selections? Paper is known for its wide collection of fine beverages. You can order bottles of Champagne, Whiskey, Vodka, Gin, and Rum, all from the finest brands available on the luxury beverage market. If you planning to splash some cash we recommend on of the drink packages you can find on the Paper Club Bottle Price Menu. 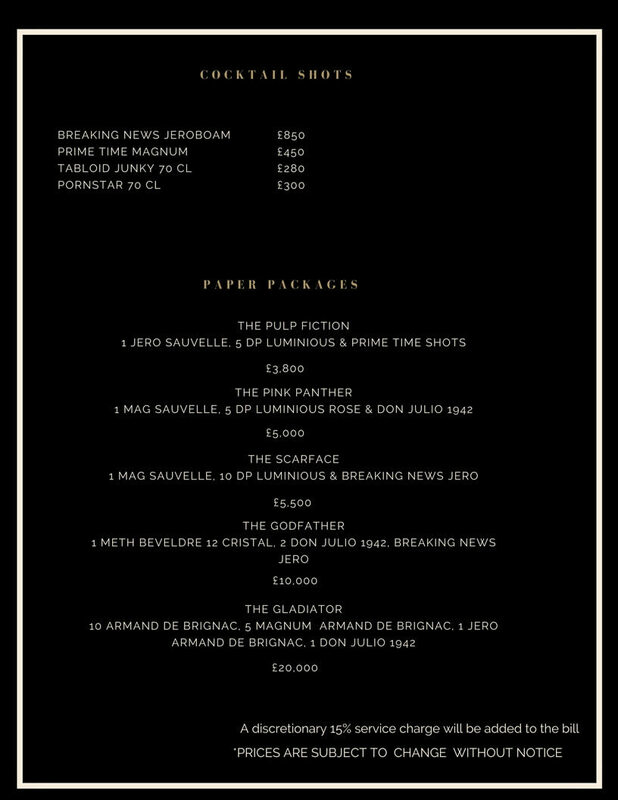 The cheapest is the ‘Pulp Fiction’ for £3800, including 1 Jero Sauvelle, 5 Dom Perignon Luminous as well as Prime Time Shots. ‘The Gladiator Package’ is the most luxurious package you can get at Paper London for a total price of £20.000. The package includes 10 Armand de Brignac, 5 Magnum Armand de Brignac, 1 Jeroboam Armand de Brignac and 1 Don Julio 1942. It can’t get better than this. Also check out the Paper London Birthday Package deals we have in store for you as an added option for your night out. The Paper Club Entry Price is certainly peanuts even for guests on a lower budget. 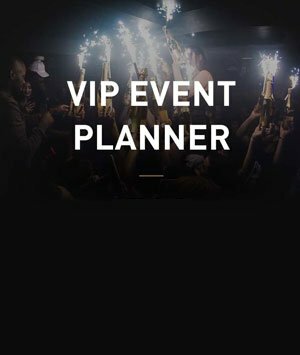 If you are intending to get only on the Paper London Guestlist, feel free to contact one of our night guides. For Paper table bookings a minimum spend per table always applies. The final amount of the minimum spends always depends on the male/female ratio as well as the overall size of the group. Standard tables generally start at £1000 minimum spend, the VIP tables at £2000. Tables at Paper are suitable for 10-12 people and the group should always ideally have a good mix of ladies and gentlemen. In order, guarantee entrances its important everyone intending to enter club applies to the Paper dress code policy. 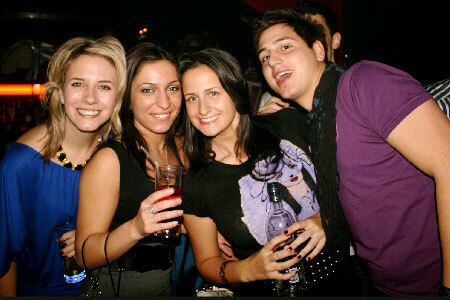 Guests are expected to dress to impress, meaning ladies ideally in dress and heels. Guys are not allowed to wear trainers or caps. If you have any more questions on the Paper Club Bottle Price Menu check out the menu below. 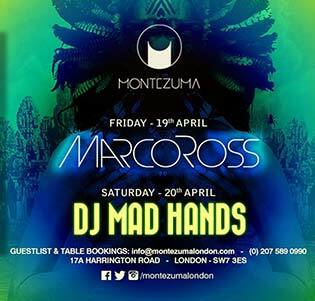 For Paper table Bookings, birthday packages, or Paper Club Guestlist reservations we can always give you a hand.